The carol, “The Twelve Days of Christmas,” is one of my favorite carols. 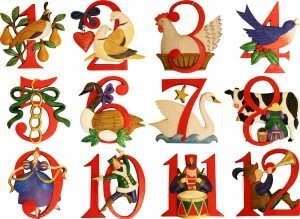 I love the symbolism in the carol….and I simply love the actual twelve days of Christmas. While most of the world gets ready for Christmas at about the time of Halloween, I prefer to hold off on decorating our home until at least the third week of Advent. Even then, we usually do not light the lights on the tree or other decorations until Christmas Eve. I like the quiet stillness and darkness of Advent. It is a time of contemplation and preparation. Once Christmas Eve gets here, all the lights come on! From that night, through the Epiphany on January 6, our house will remain lit with the twinkling lights of the tree and other decorations. The air will continue to ring with the Christmas carols and songs of the season. Follow the links below to read about each day during the “Twelve Days of Christmas” or Christmastide, as it was once called.